Today, Lindsey (also of A Design So Vast) shares 7 great chapter books for kids (especially boys). 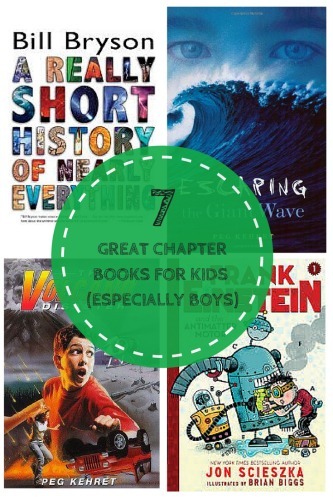 See also, Lindsey's roundup of great books for boys + this crowd sourced collection of recommendations for books for boys! I spend a lot of time thinking about books for my daughter, 12, and my son, 9. They love to read and keeping up with their changing tastes and interests is both fun and, sometimes, difficult. While my daughter is easily engrossed in a book (with the exception of a few classics, to my chagrin), my son Whit's imagination is harder to capture. Finding books that he loves and wants to read is a constant challenge for me. I am always looking to trade suggestions of books other boys of the same age have liked, and love sharing what it is my son is reading. 1. Right now he's engrossed in The Secret Series, by Pseudonymous Bosch. This series of five books begins with The Name of This Book is Secret, and the plots seem to be as inscrutable and difficult to decipher as the title implies. At least for adults, which I think is part of the fun. Whit is now on book 3, and he tells me that each features the same main characters engaged in different adventures. Each book centers on one of the senses, and the story and plot relates to that (book 1, smell, book 2, hearing, book 3, taste). The first book taught Whit about synesthesia, and we have had fascinating conversations about that. All I really know is that he's riveted and staying up after his bedtime to read by flashlight, and I love that. 2. Frank Einstein and the Antimatter Motor, by Jon Sciezska, was another recent favorite. Whit was dismayed to learn that the second book in this series was not yet out (it will be released in March, 2015). Frank Einstein is an inventor whose contraptions are entertaining and awe-inspiring. "He made a bike that flies," Whit told me. This book is fantastic for kids who are interested in the way things work. 3-6. The Volcano Disaster, by Peg Kehret, absolutely engrossed Whit. Like the I Survived series, these stories take their inspiration from real world events (in this case, disasters). They are relatable and exciting without being scary. Whit also read and enjoyed Escaping the Giant Wave, The Blizzard Disaster, and Earthquake Terror, all by Kehret. 7. Finally, slightly different but equally riveting for Whit is Bill Bryson's A Really Short History of Nearly Everything. This book, which has short two-page chapters covering everything from Einstein to atoms, is beautiful illustrated and makes science entirely understandable. As I write this, Whit is curled up on his floor reading Bryson's book. I just called out a question to him and in response heard, "Shhhh, Mum! I'm reading!" What chapter books do your kids love? Feel free to share them in the comments below! Giveaway Goodness: 128 GB iPad Air 2!